Fourth and Ten: Cause and Effect and Nouns! Today was a really fun day in the classroom! We survived our second to last Dare lesson. I'll spare you the details but the general idea of the lesson was about second graders, alcohol and a tree house. Talk about the fun ole time. One of my favorite things about blogging is the sharing of ideas and resources. 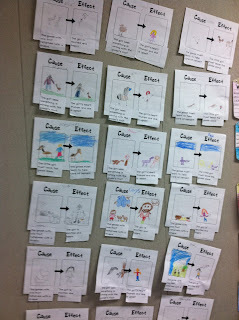 Today we used Courtney's cause and effect organizer for a fun cause and effect activity. I had the students buddy read the story and then I gave them a slip with two events of the story on it. They had to determine which one was the cause which one was the effect. A proud teacher moment occurred when I saw several students visit our anchor chart and review our cause and effect words to figure out which event was the cause and which was the effect. 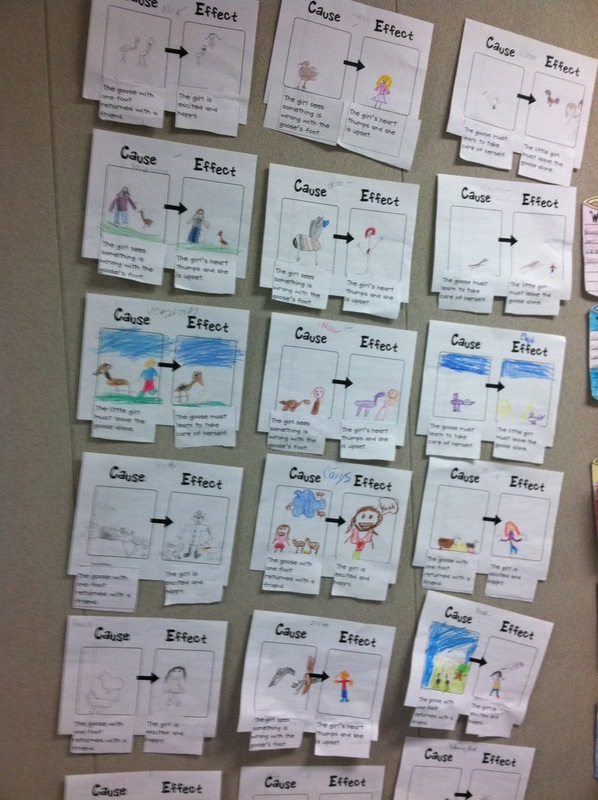 For example, this student used the word so to determine the cause and effect. "The goose with one foot returned with a friend SO the girl is excited and happy." Here they all are hanging up in the hallway! My kids really enjoyed this activity, thanks for sharing your organizer, Courtney! 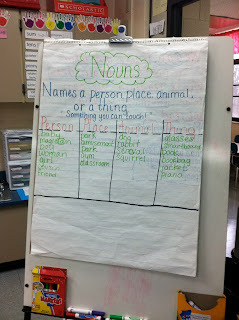 In language, we've been studying nouns. We don't follow Treasure's grammar anymore with the adoption of our new writing program. We use Being a Writer, which I really enjoy. It's been a challenge fitting in our writing lesson and teaching necessary language skills but we're making it work! I had my kiddos do a noun hunt with our weekly story, A Goose's Story, and then we added the new nouns they found to our anchor chart. My kids really enjoyed this activity and were so engaged, carefully glancing through each page to find nouns.We then glued everybody's notecards on another anchor chart to display in our classroom. Tomorrow is my second of eight biweekly all day meetings on the adoption of the Common Core. I am loving the experience but creating good sub plans is always a difficult task! Hope your Wednesday's were wonderful! Looks like your kiddos have been busy!! Love it! We do 'Goose's Story' next week. I always get a little teary, but not as bad as in 'Nutik, the Wolf Pup'. A the end I tell them, "Goose found a husband, got married, and had goslings" and it's all okay again. Yeah! I'm glad that you could use it. I love it when I hear or see those things that seems like I am getting through. Good luck with your sub plans! I hate doing those. I'm glad you and your kiddos made it through DARE! Yikes! God luck at your CC training tomorrow! :-) All of your activities and lessons look awesome!! !